Baby Joe Taimanglo is fighting to stay relevant in Bellator’s bantamweight division and a win over former champion Joe Warren will only solidify his placement atop the division’s rankings. 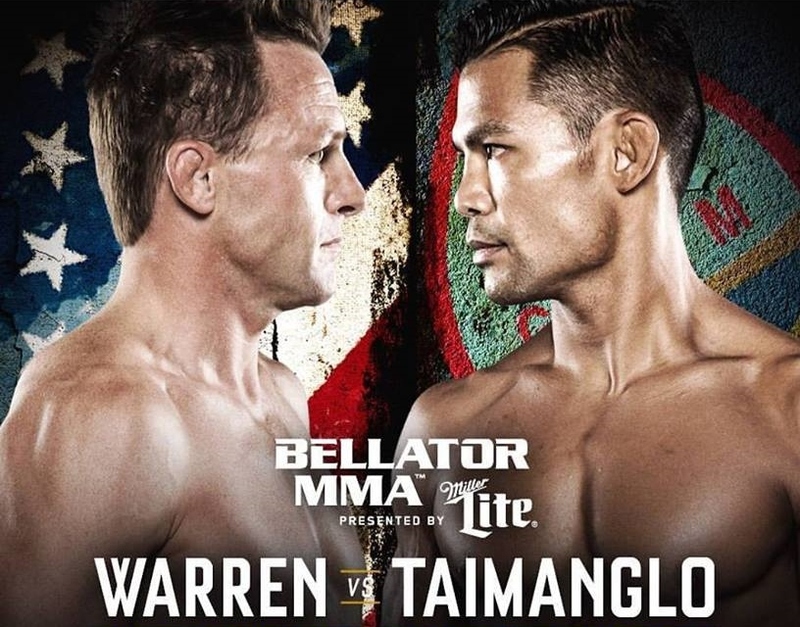 Taimanglo-Warren will be the co-main event in Bellator 195 on March 2nd (March 3rd on Guam) in Thackerville, Oklahoma. The main fight is for the title between Darrion Caldwell and Leandro Higo – the two men last to beat Baby Joe in 2017. But for now, the sight is on Warren (15-6), a 41-year-old former Greco-Roman wrestling world champion going into his 19th fight under the Bellator umbrella. Though eight years younger than Warren, Taimanglo has put in more miles, fights and years than his older opponent. Baby Joe (23-8-1) has 11 more pro fights and has fought professionally five years longer. “I feel tired,” BJT said. “I’ve been doing it since I was 19. I still push through any kind of situations. I’m all natural and that’s what separates me from being who I am and to be the next world champion. After nearly five years with Bellator that saw him relocate from Guam to San Diego to concentrate on his fighting career, Taimanglo is relying on that old Chamoru work ethic to get him through this fight camp. With just two fights left on his current contract, BJT wants to give the title shot another go. A cloud that has hovered over his head in the past is his ability to make weight. He says that’s not a concern this time around. Baby Joe shocked the world in July 2016 when he upset current champion Caldwell via guillotine choke as a -1500 underdog. Caldwell was undefeated then and was on the fast track to a title shot. Caldwell would redeem the loss to Taimanglo five months later with a unanimous decision win before taking the title from Eduardo Dantas last October. Warren lost his title to Dantas in 2014. As for the style comparison between the 5’6″ Warren and 5’10” Caldwell, Baby Joe stated the obvious height difference. Going into his 11th Bellator fight, this will be his fifth time fighting at the WinStar World Casino and Resort in Oklahoma. “It’s going to be on TV. You get to see everything on TV with all the angles, especially the lead up to the fight.When I see the replay, it gives me goose bumps. I do get chills when I see Frank (Camacho) and Jon (Tuck in UFC) when they go in there because they make the sacrifice to show up and fight. Now 33 years old and miles of the sport starting to take its toll, Baby Joe looks back being grateful for all the support he’s been given (especially from his mother Josephine) but also still has his eye on the prize with Joe Warren right in front. 76/Circle K will be holding a pre-fight promotion for BJT at their Dededo gas station on March 1st from 3-8 pm. Everyone spending $20 or more on gas will be receiving a free BJT promo item. Fuetsa, So Kel Guam, SPPC/76, Genesis Recovery, Mi Sazon Mexican Grill, Fuesta, Sen. Dennis Rodriquez, Route 1 Tees, Sign Write, Myrnas Beauty & Barber Shop, Gutierrez/Bordallo, Chode’s Food Service, Sign Write, DJ Gabbyman, DJ Quen and Sam Ochoa.